Since its opening in 2004, the F.X. Mayr Health Center in Baabe developed to be an attraction for people with the objective to become healthy and stay healthy. Dimension and furnishing of the domicile were deliberately and consequently installed according to the demands of a successful Mayr therapy. It gives a comfortable atmosphere of silence and coziness, which is always appreciated by our guests. Our center offers you a place with a calm and familiar atmosphere, our friendly and professional service team makes you feel comfortable. The Health center, that fits harmonically into the traditional architecture of the Baltic resort, is just about 200 m away from the beach of the Baltic Sea. A bathing section with sauna area, massage and colon hydro therapy, as well as a gym are located inside the center. Furthermore, the medical practice is included. On the second floor you will find the lounge resp. dining and seminar room, the tea bar and a specialised library with a comfortable reading area. Due to the high quality standards, our center is one of the few certificated F.X. 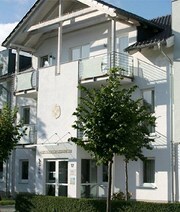 Mayr health centers in Germany (Internation Society of MAYR PHYSICIANS). In 2013 we received the reward of the European Centre for Allergy Research Foundation (ECARF) as an allergy protecting institution.